A black and white negative of the Whitby Builders Junior "A" Lacrosse Team. 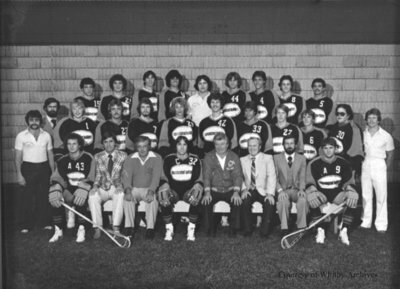 The Whitby Builders Junior "A" Lacrosse team won the Minto Cup in 1980. Whitby Builders Junior "A" Lacrosse Team, 1980, Photographer Unknown. Whitby Archives A2014_002_035A.